When we think of going camping, we already assume that all the food can be cooked on the open fire. While this is true and it is definitely a fun way to cook, it is not always the best method if you are into fine cuisine. A camp grill will make all the difference in the world and allow you to easily cook all your foods to the perfect temperature. Camping is something I always enjoy. No matter the time of year, it always seems nice to break away and experience what nature has to offer. Before using the portable gas grill, I heavily relied on the fire we made to serve as a camp grill. However, I got the opportunity to experiment with a much better piece of equipment and this made all the difference to my meals and the whole of my camping experience. Doing some in-depth research, I found the best portable grills. This took a couple of tests and a lot of grilling, but who can complain? In this article, we take a deeper and more intricate look at the camp grill and all of the features. You will also find the best portable grill that should meet all of your needs and enable you to enhance your experience. There are numerous great features associated with the top camp grills and how you should go about choosing them. While we have included them in this article, we thought you might want to have a look at the top options first. Here are the best camp grills currently available on the market to enhance your overall camping experience. 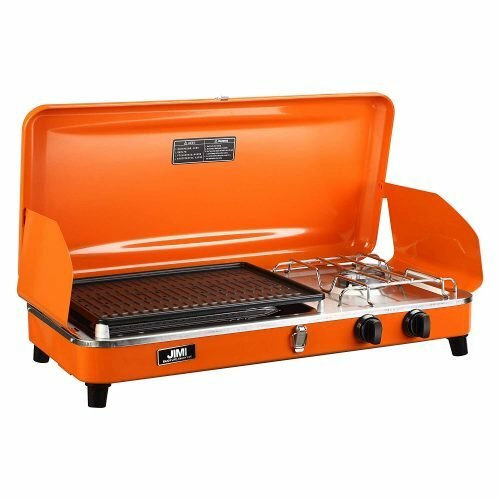 The first grill on this list is the JIMI Outdoor Dual-Burner Camp Grill/Stove Portable Gas Grill and it is one of the smaller options on the market today. It has been constructed from cast iron with a stainless steel cover. This gives it amazing durability as a camp grill and should be able to withstand a lot of the temperatures that you put it through. While it is not exactly designed for making your own fires, the grill works with a propane gas tank. The gas tank is not included, but the massive 30-inch hose will make it really easy for you to reach the grill when the heavy tank is situated on the ground. Additional wind blockers have also been added to the sides and these will ensure the fire is burning comfortably. I am an avid backpacker and I find this grill to be somewhat too heavy for backpacking. However, camping seems to be perfect when you set it up. I personally used a smaller table to have it elevated from the ground and the 170 square inch cooking area can help you cook for up to 6 people. Some even claim that it cooks for 8 people, but this will depend on how much you eat, I suppose. Versatility is always imperative when looking for camping equipment. Instead of only having to rely on the grill, you have 2 burner stoves includes. 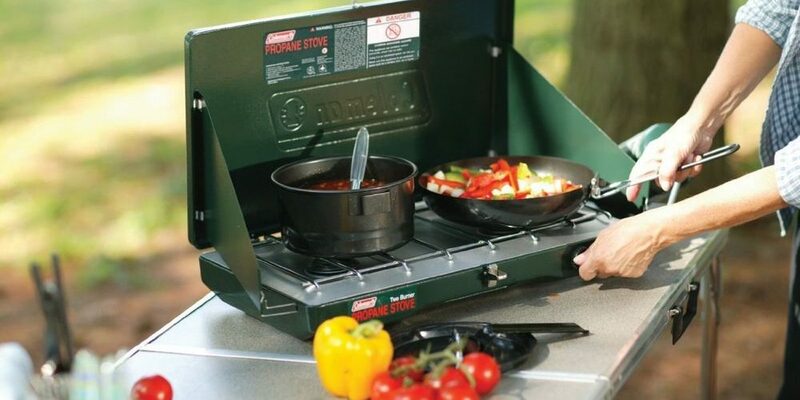 This enables you to cook a wider variety of meals on the camp grill. It took me less than 30 seconds to fully set up for the camping trip and it easily fits into most car trunks. I also think it works well for tailgating and enjoying your favorite meals. The larger size and the dual functionality does make the grill a little more expensive than many people might expect when buying. However, you will be using it for a very long time and it is recommended that you consider repainting it after a little while. Overall, this will be an excellent investment if you are into camping and you go outdoors often. It is also worth noting that it can be used for visits to the park as well. The Coleman Classic Propane Stove is more of a camping stove than a camping grill. It has been durably constructed with aluminum as one of the main materials. While this might not seem like much of a benefit, it does keep the weight down to only 11.5-pounds. This is easy to move and fold when you are moving to your camping site of even attempting backpacking trips. There are different setting when it comes to the burners, you can set them to the ideal temperature that would make life a little easier for you. A 16.4-ounce propane gas cylinder should allow the burners to function for up to 1-hour at the high setting. I believe this will be more than enough cooking time for your camping trips. However, having an additional cylinder might be beneficial. The burners are quite large and we managed to fit in 2-12-inch cooking pans. This meant we could cook food for a wide variety of people in one setting. Additionally, heating up coffee is simple and we can cook breakfast and heat up the coffee all at the same time. Coleman has included PerfectFlow technology for this stove. It makes it possible for you to have the temperature regulated consistently and get the same quality results over and over again. Coleman is one of the leading brands and they have been in the industry for quite some time. I personally rely on most of their products to get the job done effectively. The grill might not be elevated from the ground, but when placed on a secure tabletop, you will notice how stable it remains. The wind protectors will also serve you well to keep the wind from potentially spoiling your cooking experience. While the heat can easily be controlled, I find the knobs to be quite flimsy. This makes it hard to adjust the heat to the perfect settings that you might need. However, if you have some basic skills with mechanical tools, it can be taken apart and you should be able to make a couple of quick fixes. I recommend asking for expert help if you don’t have any real skills in this department. My favorite part is definitely the price. The stove might not have a grilling section as many people might need, but I like the affordability. Most Coleman products also include decent warranties and if you do some searching, you could find many products that work in conjunction with this stove. We definitely recommend it for the value it offers. 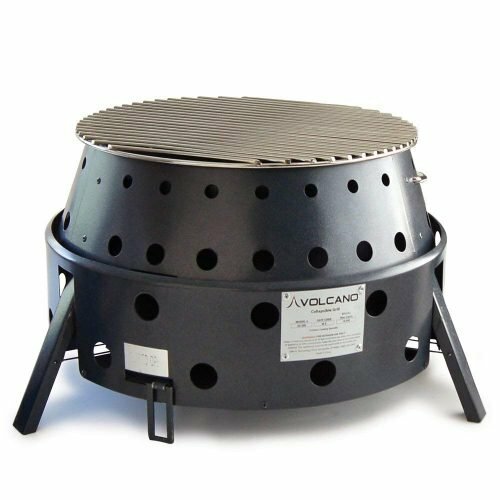 The Volcano Grills 3-Fuel Portable Camping Stove/Fire Pit is one of the best grills I have ever come across. It is durably constructed from cast iron and the stainless steel coating will keep the rust away at all times. It folds down to just over 5-inches, making it perfect for carrying long distances if you can get past the 20-pound weight of the overall design. Since it is fully enclosed at the bottom, the grill does not pose any real safety risks. I find this to be really beneficial for nature and you won’t accidentally burn down the camping ground that you so dearly love. The grill is mostly marketed for use with a propane gas tank, but we have seen that you can actually use different types of fuels as well for starting the fire. Propane is quite expensive as well all know and the gas tanks can be a hassle to carry around. However, you can also use wood or charcoal to ensure that you have enough heat output for cooking. The grill will be able to handle a maximum heat capacity of up to 19,000 BTUs. I found this as a great grill for cold winter months and it will also keep you warm when needed. Setting it up seems simple as well. I found it easy to set up and this can be done in just a couple of minutes. If the weight was a little bit lower, you could easily use it for backpacking purposes as well. I have personally tried to use it for backpacking, but the weight will eventually take its toll on your body and hold you back when hiking. With all these excellent features, one might easily be drawn to the grill. This is a really good piece of camping equipment, but with a cooking space of only 144 square inches, you can cook around 4 steaks. It serves well for smaller families and even for couples looking for the perfect break away. It might not be the best cooking tool for your larger extended family members. Talking to a couple of newcomers to the camping scene, it should be no surprise that they consider this grill to be quite expensive. However, I have used it through rigorous time and the durability definitely makes up for the price. While there is no real warranty that has been included, I believe this grill should be one of the last grills you ever buy for camping. Coleman is one of the brands we cannot keep off the list. The Coleman Camp Propane Camp Grill/Stove is the ultimate Coleman answer to give you versatility and value for your money. It has been constructed from solid steel and the stainless design should also keep the rust from ever setting in. Wind protectors made from aluminum will keep the wind away from the burner as well. As you might have already picked up, this is not one of your standard grills. It includes a burner stove that will be fuel by propane gas. The whole grill is fueled by a propane tank of gas. 2 different knobs have been included on the front of the grill and this will make it possible for you to regulate the temperatures to your desired needs. Coleman has been known for adding some of the best technology features to many of their grills. PerfectHeat technology has been introduced. This will ensure that all of your heat will remain consistent. According to Coleman, the maximum heat output is around 20,000 BTUs and should warm up the surrounding area as well as your food. I personally used this grill for cooking. What I found was that it might be a little small for many people to use. However, it is really stable. Anti-skid rubbers have been integrated to the bottom of the grill. This should allow you to cook on slippery surfaces. All the technological integrations also mean the grill will not use as much gas, saving you a couple of bucks in the long run. Every camp grill does have a couple of flaws and these flaws can be detrimental to the quality of your cooking. For this Coleman grill, you might need to replace the grill itself. Yes, it will last you a couple of cooking hours, but I found that it does eventually melt. Nothing is more frustrating than trying to clean a melted grill with black marks all over. Lastly, the price is one of the concerns that some people might have when looking for the best portable grill. However, Coleman strikes the perfect balance between affordability and quality. You are also entitled to the Coleman warranty that has been included. If you are looking for the perfect grill for your short trips, this will be one of the top options to consider. Camco is one of the leading outdoor brands. It is really popular in the US and many people rely on some of their other outdoor equipment as well. 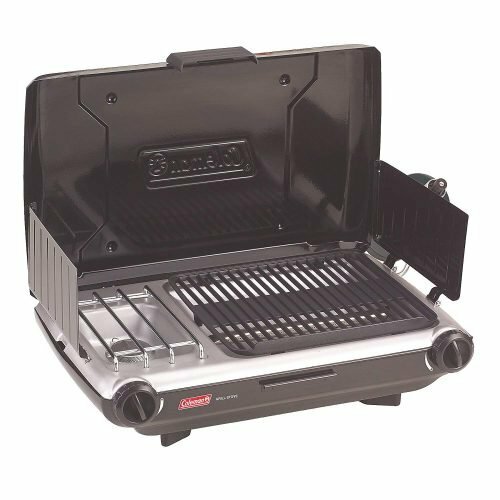 The Camco Olympian 5500 Stainless Steel Portable Gas Camp Grill comes in many different forms and you can find different types as well. Made from lightweight stainless steel, it only weighs a mere 11.6-pounds and will be resistant to rust. What I like about the grill is the complete design. It features different power sources that could potentially benefit you. Propane will be the best option for camping, while the electric grill will be perfect for your home. Standing around waist height, it is perfect for cooking with the utmost of comfort outdoors or on your own patio. The average heat output is 12,000 BTUs. This might not be as spectacular as many of the other grills, but it will easily cook your food. I prefer the lower heat output and this will save you a couple of bucks on constantly refilling the propane tank. If you have a propane supply hose connected on your RV, it can be used indoors as well. The 180 square inch grilling surface is one of the best takeaways. I use it for cooking multiple dishes at the same time and it speeds up the entire cooking process. Some people also claim that you can add charcoal or wood to the grill for a fire. However, I find it frustrating when it comes to cleaning the grill afterward and removing some of the black spots. The design of the grill is great, but I would have liked to have the edges refined slightly. These sharp edges do pose a risk that could potentially harm you when you are cooking. However, they work well to keep the wind at bay and since it can be closed fully, your heat retention will also be much better when cooking specific meals. My main concern is the price. If you are not going to use the grill often, it might be a little too expensive. 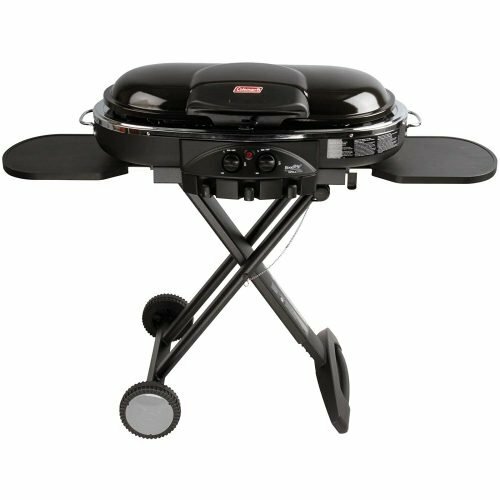 If you do purchase the Camco Olympian 5500 Stainless Steel Portable Gas Grill, you should have it set up at your home as well. Additionally, you will receive a 1-year limited warranty to keep you protected and allow you to test these features. As part of a recent trend, people are gravitating towards choosing grills capable of standing on their own feet. 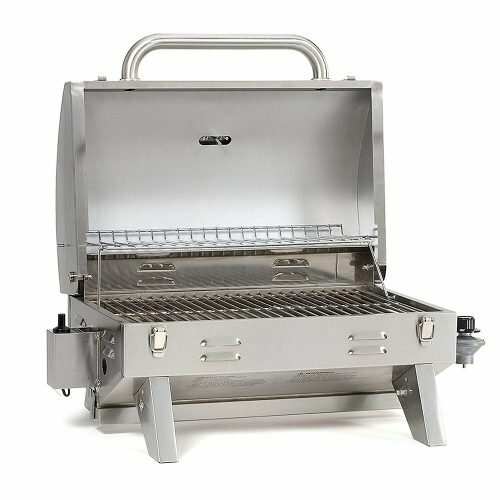 The Smoke Hollow 205 Stainless Steel TableTop Propane Gas Camp Grill is another one of these freestanding grills. Made from stainless steel, it should be lightweight, but the large design toes make it a little bulky to carry. The grill features one of the largest cooking areas I have seen in a long time. However, this has been split into two different sections to simplify your life. You will have access to the primary 205 square inch cooking space, but 105 square inches has been added as the warming rack. I have used both areas for cooking if I need to cook for large groups of people. A propane gas tank is once again the best method for heating up the grill. The company suggests that the maximum heat output is 10,000 BTUs. It might not seem like much, but when you take into account the fact that the grill can be closed, the heat retention is actually quite impressive and you won’t need to use too much gas. The gas-measuring tool that has been included will ensure that you don’t run out of gas on any precarious moments. I recommend having an additional gas cylinder in your kit if you plan on longer camping trips. Folding the feet is rather easy and you can then simply move the grill somewhere out of the way when it is not in use. The igniter is something you always need to keep your eyes on. Some people have complained about it failing, but we have not had to deal with this problem so far. However, you should keep it in mind. Should you experience any problem, it is worth keeping in mind that customer service is great and they are really friendly if you have a problem. For the quality of the grill, I think it is definitely worth the price commanded. It might be a little short and you need to elevate it with a decent and solid table, but once done, it will get the job done efficiently. A small warranty is included to give you peace of mind and allow you to test all of these features to their maximum capabilities. I haven’t had the chance to deal with many Cuisinart outdoor products as of yet. 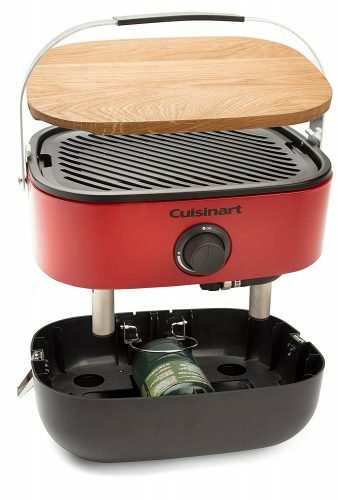 They are well known for some of the best coffee makers and this gave me a lot of optimism for the Cuisinart CGG-180T Petit Gourmet Portable Tabletop Gas Grill. It is made from steel, aluminum, and oddly, they have included porcelain to help with heat distribution. I found the grill to be really lightweight, which means that you can easily carry it from your car to the camping sit when needed. The large 145-square inch cooking space will cook up to 8 burgers at the same time. However, it might not be the best option for cooking 8 large steaks thoroughly. In terms of consistency, Cuisinart claims the addition of porcelain will regulate the heat and distribute it evenly. The overall design is made for portability and it will be really easy to carry as well. I like the small handle that has been incorporated. This will allow you to carry it much in the same way you would expect to carry a briefcase when you are heading off to work. As you already should know, propane is used for the heat source, but the maximum heat output is only 5,500 BTUs. Cuisinart really tries to go the extra mile. Instead of only releasing a version for you to use on your tabletop, they have included stands. It might need to be purchased separately, but you can then use the grill for cooking in the field when there are no stands or tabletops to rest the grill on. I found the additional stand to also be really stable. My biggest concern is the low heat output. Yes, the grill can be closed when you are cooking meat or any other delicate product, but you will be burning up a lot of gas. You will be spending a lot of money in the end on constantly refilling your gas cylinder if you only have access to a smaller cylinder. When traveling, I also sometimes put other products on the grill. The locking mechanism will keep them in place and you can save some storage space. Cuisinart always tries to keep the price affordable. Once again, this grill is designed to be affordable to the average camper with a middle-class income. It includes a decent warranty and you will be protected with excellent customer support as well. I would highly recommend the grill for anyone looking to get the best possible value for his or her money. The next one is – you guessed it. Coleman once again features another entry on this list. The Coleman Road Trip Propane Portable Grill LXE is one of their more modern grills made from solid steel and aluminum. This grill is not only designed for camping and outdoor trips, but the stylish design enables many users to also use the grill on their patios. Cooking for the family is really easy. The grill features a massive 285-square inch cooking surface. While this is only a grill when you first open it, Coleman has included a flat top as well. Now, you can use the grill for cooking different foods correctly and your fish will no longer fall apart and disintegrate into your fire. As we have mentioned, this is one of the most modern designs that Coleman has come up with in recent years. The grill includes two stands on either side. These stands can be used for storing your tongs and some of the spices that you plan on using. As a camp grill, it can be folded for easy storage when you need to move it. Additionally, the best portable grills lack wheels. Coleman seems to have changed this and this grill will include large wheels that can be used over multiple surfaces. Using propane gas, the grill has a heat output of 20,000 BTUs. I found this more than enough for cooking meals and even to ensure the steak is well done for those meticulous friends. As for the downside, I should reiterate the fact that the grill is really heavy. At 44-pounds, you will need some help to carry it if you are an older individual. However, the wheels we mentioned make it possible to move it around for long distances. Personally, I won’t use this for backpacking, but if you think it can be used for it, you can try. Since this is one of the elite Coleman grills, it is somewhat expensive. However, when looking at a camp grill in general, it is hard to find all of the features you will find on the Coleman Road Trip Propane Portable Grill LXE. The warranty should always keep you protected and we would recommend it for the value and the versatility it offers. 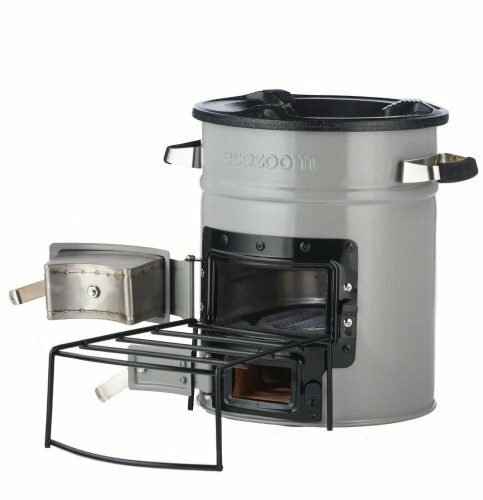 If you are tired of carrying your propane gas cylinder around for your camp grill around when camping, you should consider the EcoZoom Versa Rocket Survival Stove. As the name suggests, it is designed to be eco-friendly, helping to save the environment when it comes to gasses being released into the atmosphere. The cooking area is quite small and this is only used in the same way you would be using a stove. The grill area is not ideal for cooking meat and the flames are hard to control when dealing with wood and charcoal. With a massive heat output of 23,000 BTUs, it is used for generating a lot of heat when not used for some form of cooking. The design is made to force gasses to mix with the flames. This burns up most of the gasses, leading to fewer emissions. However, you also have an emergency tool for when things do go wrong. Many people feel like completely closing the stove, but you should always leave a small area for some of the heat to escape. However, the heat cannot be directed in a specific area. I find that this grill is one of the best options for those looking to survive in nature. It might take a little longer to get started or to cook your food, but you are experiencing all that nature has to offer. The materials are really durable and after many years of use, I was surprised to find that the steel did not budge in any real way. My main concern was cleaning the stove. Most of the components are secured on the inside and you won’t be able to fully reach every spot. One of the tips I found was to use hot water for the loosening of some of the burn marks. Eventually, this will wipe off easily and when you drain the grill, it will be cleaned efficiently. In the short term, the grill might be expensive to buy. However, you will be having a lot of money on the propane gas cylinders. I have also seen many people use this grill as part of there BBQ means when cooking home. As a word of warning, this stove is not recommended for indoor use and you should try to keep it outside, especially with some of the gasses being released. Last but certainly not least, we have the Cuisinart CGG-750 Venture Portable Gas Grill. Once again, Cuisinart has come through for us with a one-of-a-kind design that makes it really easy to carry and simple to use. Made from stainless steel, the grill is not that heavy. However, adding the propane does make it a little heavier. Since it can be folded and carried like a briefcase, the grill should not be that hard to move from one spot to the other. It includes a large 154-square inch cooking area, capable of cooking multiple different burgers for you and your family. The stylish red color also makes the grill stand out amongst many of the other grills on this list. While propane is used, the heat output is only 9,000 BTUs. It might not seem like enough to keep you warm on those cold nights, but it will cook most of your meals relatively quickly. The wooden chopping board makes for a great addition and you can use this for preparing many of your meals before you are ready to place them on the grill. Cuisinart is one of the brands that include porcelain as part of the grill. This porcelain will ensure that the heat is evenly distributed amongst the grill. I also find the flat top to be really well designed for cooking flaky meals like fish. It allows you to cook without losing half of the food into the fire, something that often happens when you have had a few beers. 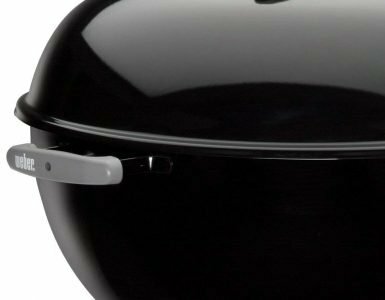 The grill can only use a small 1-pound propane cylinder. The cylinder might not last you very long when you are cooking for many people. Additionally, it also forces you to carry a couple of other gas cylinders extra. On the upside, the smaller trips are perfect if you have this grill on hand. I also like it for tailgating at the big game. The price is really expensive for this small grill, but I have not really seen any complaints in terms of durability. You also have a decent warranty included, but you should only consider buying this grill if you are a frequent camper and outdoor enthusiast. You have seen all of the grills we like and you now have the opportunity to find out how we went about selecting them. As with each product, we do in-depth research to understand all of the features before testing them. If none of these grills appeal to you, this list of features will definitely help you when choosing a different camp grill. When it comes to buying a grill, the materials it has been constructed from is something you always need to keep in mind. Most grills, especially the portable options, are made from stainless steel. While stainless steel is lightweight and easy to carry, it does not compare to the quality of a cast iron grill for overall durability. Cast iron is quite expensive, but the chances are much lower of the burning through, forcing you to buy a new one. The cooking capacity refers to the size of the grill. When choosing your portable grill, you will find an indication of the size. I prefer choosing a grill that is a little larger than 130-square inches. This is ideal for cooking food for a normal-sized family. However, larger grills are also available and they will make it possible to cook for the entire family if you need to. The grill size is one of the first aspects you should look for. If the grill only features a stove, you can also make great use of it. While your hopes of the perfect BBQ might not come to fruition, a warm stew is always beneficial when you are looking to warm up some of your friends. I also love having the stovetop included for making coffee or any of your favorite hot beverages. According to statistics, tea is the second-most consumed beverage after water. As you might have picked up, propane is the most common power source used for the camp grill. Propane is found in gas cylinders and will power the coals that you have added to the grills. It is a highly flammable substance and the temperature is also really easy to regulate. This will result in quality cooked foods, much like your gas stove in your kitchen. However, more and more people are becoming eco-conscious. With the rise of eco-awareness, we are slowly seeing more and more natural grills. 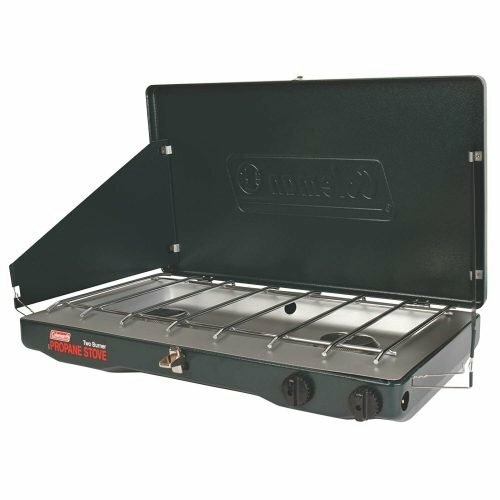 The eco-friendly camp grill works with either charcoal or wood and they have no space added for the propane gas cylinder. On the downside, you will not have much control over your heat. The upside is being aware of the environment, resulting in less poisonous gasses being released over time. If you like to experience everything nature has to offer you, it is much better to choose the wood stove or to be eco-conscious. Imagine yourself standing next to the cooker on a cold winter’s evening. To combat the cold, it is always fun to have some sort of heating source. However, the portable camp grill is not designed for heating you up in cold weather. It is much rather made for cooking your food efficiently. The measuring method for gas grills is BTU or British Thermal Units and this will tell you exactly how much heat is being radiated. If you are only using the camp grill for cooking food, you can do with a low rated camp grill. The lowest rating we would recommend will be around 8,000 BTUs. However, we have seen grills that will run around the 23,000 BTU mark. This is more than enough to keep you warm on those cold winter evenings when the heat is fading. However, it comes nowhere near the heat output of the top wood stoves with ratings that could range up to the 80,000 BTU mark and heat up a larger area or room. Can it be cleaned efficiently? While the camp grill works wonders when you receive it new out of the box, it needs to be cleaned every so often. The ability to clean your grill needs to be taken into consideration as well. Most grills will eventually have massive burn marks that make them quite tough to clean. However, I have found that simply leaving it to set with hot water and some dishwashing soap, some of the dirt spots will eventually loosen. If the grill poses too many cleaning problems, you will be much better off choosing something else that can be cleaned. I personally use the grills quite often at home as well. Sometimes they make a nice addition to your standard BBQ, especially when you are cooking for a large number of guests and you want everything to be ready at the same time. Versatility is one of those things that we often overlook. When you think of a camp grill, you are literally thinking of grilling your foods. However, many brands have developed multifunctional cooking grills. These will not only include a nice grilling section but a stove as well. The stove, as we have already mentioned, it perfect for creating broths and even stews to warm you up on the colder nights of your trips. The ability to create a nice fire is something I personally believe should be something you can look at. After using the propane cylinder for the food, you can continue making the fire for heat purposes and also to create a nice ambiance. Nothing compliments nature as much as having great company to join you next to the perfect wildfire while taking in everything nature has to offer. Cuisinart is one of the only brands that make the camp grill easier for you to carry. I personally like having this addition added to the grill and the handle removes some of the difficulties from moving the grill. Additionally, you need to ask yourself if you can fold the grill into a smaller piece of a equipment. This will make it easier to transport and to put away in your garage when you are not out camping. Aside from the portability, you should also keep the weight in mind. If the grill is too heavy, you might need some assistance when it comes to moving it from one place to another. Anything over 25-pounds might have excellent features but is considered overkill. However, if you have an additional trolley for moving the grill, or if you buy one like the Coleman Road Trip Propane Portable Camp Grill LXE, you will have wheels that have already been included. The overall dimensions are not that important for a camp grill as this will all link into the size of the cooking surface. However, you need to keep the dimensions in mind when you plan to travel with the grill. Will it fit into your car is something that needs to be considered. Finding out is really easy. Most grills will indicate the size and the dimensions and you can compare this with the trunk of your car. However, a pick-up might be a better option for larger grills. No matter the type of outdoor adventures you enjoy, we all grow fond of a couple of brands. If you are like me, you will try many brands, but only one of them will always keep you coming back and expanding your gear. Most brands also design different pieces of equipment. 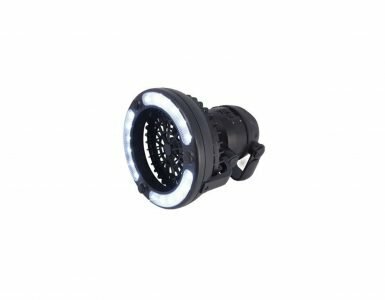 Sometimes, many of them can work together and this will simplify your experience and keep you from needing to create different add-ons for your gear. Another reason I always look at the brand is to avoid knock-offs. A grill is something that can easily be reproduced by lesser brands trying to charge you a little cheaper for something that looks the same. While you should not go out of your way to find the most expensive grill on the market today, it is better to do a little research and find out which brands are internationally recognized. Asking some of your friends or even co-workers should shed some light on this topic as well. Building on the brand topic, we believe you should look at many of the accessories that are included and some of them that can be purchased separately. On one of my earlier camping trips, I used the grill for cooking fish and this failed completely. Since fish flakes and it is really hard to keep from sticking to the grill when cooked, you can end up like me and lose some of the meat. I eventually added the flattop grill to the grill. This meant more meat is kept when cooking fish and you can now spice the fish with oils and other spices to improve the flavor. Referring to fish is really important to me and it may not be for you. However, nothing is as delightful as eating a fish that has been caught on the same day when you are camping. We also have many additional tables that we carry along for camping. However, if you can find a grill with some of these additions already included, you will be saving yourself a lot of trouble. Coleman is designing grills with attached tables on the side for you to prepare some of the meals and even store your tongs or spices whilst the grill is cooking. At first, I never thought the warranty was that important when buying products. However, you may occasionally find a bad manufacturers problem that needs to be sorted. This is where the warranty will save you a couple of bucks. If you have a warranty, you will also find that customer service is much more cooperative and they will do anything to make your life easier. Most warranties on grills I have purchased range anywhere from 1-2 years. However, this can be extended if needed, but you should find if there are any problems within this timeframe. Damages done by burning through the metal or even holes being formed from your own negligence is not something that you can use the warranty for. Last but certainly not least, we all need to stare into the fact that the price is somewhat important when buying any outdoor gear. Camping and backpacking are not for the faint of heart and you will notice the accumulative costs of buying different gear for your camping trip. This can be a really expensive hobby, but if you love nature as much as I do, you will find it worth it. When it comes to any camp grill or portable gas grill, it is much better to spend a little extra to ensure that you do get the best value for your money. The grill is something you will always use and should many of the conspiracy theories come into realization, this grill can help you survive when you don’t have access to electricity. The portable gas grill might be expensive at first, but in the long run, you will definitely save a couple of bucks on foods that can now be cooked. How many years will a good grill last? Since many of these grills can be a little pricey, you might be wondering how long your potential camp grill will last. Unfortunately, there is no direct answer, but the materials will give you a decent indication of the lifetime. Most grills I have used for camping will last between 3 and 5 years. However, yours might last you a little longer depending on how many times you go camping. As we have already mentioned, the cast iron grill is heavier and more expensive, but it also features more durability. This durability will result in a longer lifetime. Using cast iron could potentially last you for the rest of your life. I would say that a portable gas grill or camp grill would last you between 3 and 5 years if it were taken care of. Which size propane tank should I use? However, I personally prefer the 20-pound propane tank. Yes, it might expensive and really heavy to carry, but you can camp for a week or even more with this tank. When used, the tank should power up your grill for up to 20-hours. If you have a grill with control knobs for the propane tank, you might be able to squeeze out a couple more hours from each tank. These tanks can also be refilled, ensuring that you only need to make the once-off lump sum payment for the tank. As a word of advice, I would recommend ensuring the tank is securely sealed without any leaks. The propane is really flammable and can cause a massive problem once it starts leaking in your storage area. Before storing, you should always double check to see that nothing is leaking. It is also recommended to check the rules and regulations for camping with a propane grill. It is important to keep in mind that you should not use extremely hot water. I have seen this method work perfectly well when only using lukewarm water. You are only looking for a little bit of condensation to take place and a slight change in temperature to help you find the level. Alternatively, buy a portable gauge to help you measure. Can I use a camp stove for grilling? Contrary to popular belief, you can actually use your camping stove for grilling as well. The stove can be fitted with a nice frying pan and if you have a couple of smaller grates, you can set them inside the frying pan. This method might seem like a lot of work to many people, but if you are currently saving up for the perfect camp grill, it could get you started. The downside is that your meat will never directly touch the flames. If you like, the taste of meat coming from a proper grill, you are better off buying one of the above-mentioned options. However, if you are not a barbecue fanatic yourself, you might not even taste or know the difference and this method could save you from buying something you won’t need. Can I use these stoves indoors? If you want to take the risk, you can use any of these stoves inside. However, it is not recommended and since propane is highly flammable, you might be setting yourself up for a massive disaster. Most of these camp grills are designed for camping and outdoor use. This is indicated in the instructions and you should note that propane can cause a rapid-spreading fire with ease. My personal opinion would be to not use these stoves inside your home. They might be really dangerous and this could cause many problems. If you have a gas stove inside your home, you should stick to using it for your indoor cooking needs. It is also best advised to keep the grill away from your tent. We don’t want propane sticking to your tent and accidentally catching fire. Testing many of these grills in detail was really fun and I would definitely go through the same experience again. These grills have been highly rated and all of them will get the job done in some way or another. 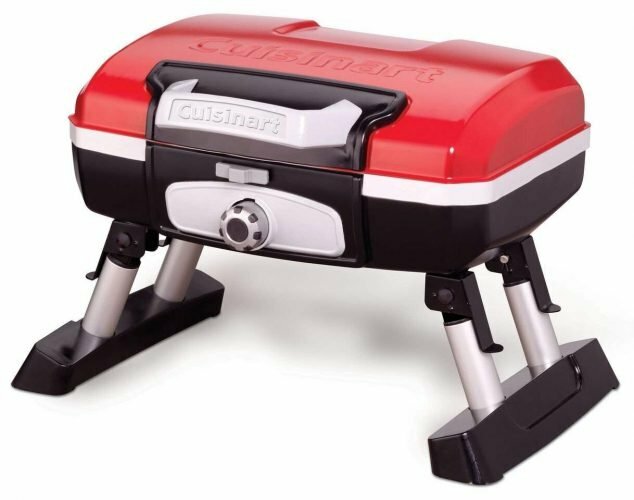 I find it really hard to recommend any one of them specifically as the best grill, but Coleman and Cuisinart are two of the brands you can definitely rely on. We hope that you have found this article enlightening and that you have found all of the information you need to buy the right camp grill. We would like to thank you for reading this article and encourage you to share some of your thoughts. Let us know in the comment section which one you like the most and if we might have missed any of your favorites.